Ok so its been a little bit since I put up a paleo-myth since my last one here where I covered the issue of dinosaur competitive exclusion of mammals during the Mesozoic ( Paleo Myth 10, 9, and 8 btw). In it I argued that it was a trifecta of immature dinosaurs, terrestrial crocodiles, and sphenodonts putting ecological pressure on mammals. Like that post I will again be dealing with size constraint on a clade of organisms except this time it will be insects. In the above picture we see a gargantuan mosquito filling up on Will Ferrel's blood in what I thought was a genuinely funny movie Land Before Time. 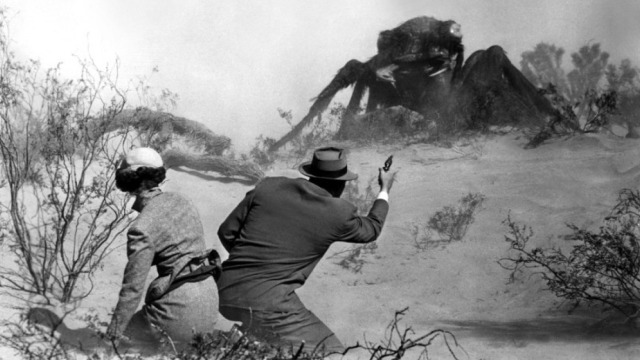 While the giant mosquito was the least of the films scientific oversights the idea of giant bugs coexisting with dinosaurs is still intertwined in many people's minds. But this is a bit of an error because the hey-day of giant exists was the Carboniferous (300mya) period so dinosaurs, who arrived mid Triassic (230mya), missed guys like Meganeura by about 70 million years. In other words, dinosaurs were separated by giant insects for a span of time longer than what we are now separated from non-avian dinosaurs (65mya). So depiction like the one above, or the nightmarish arthropods of the King Kong remake below are erroneous. So why such big bugs back in the coal era of the Carboniferous? Well the prevailing view is that higher oxygen concentration in the atmosphere (35% vs 21%) allowed insects, as well as other arthropods like arachnids and millipedes, to grow larger than today owing to all these groups having relatively inefficient repiratory schemes (spiracles, book lungs). An insect essentially lets air "soak" into it from holes in the sides of its body. As an organisms surface area increases the volume increases at a far greater rate. So eventually an insect reaches a size where it is limited by the amount of surface area it needs to respirate its internal volume. 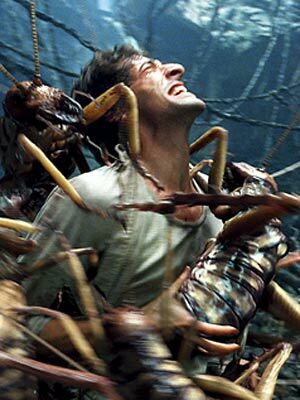 Oxygen becomes limiting to insect size. Other arthropods, spiders for instance, are less constrained by oxygen but still run into problems from their exoskeleton breaking down in strength with increasing size. If insects or other arthropods found a way to actively respire they could at least get lobster size on land before the exoskeleton became limiting, regardless of oxygen concentration. Overall an abiotic factor, oxygen concentration, appears to be the limiting factor preventing hawk sized dragonflies from buzzing the Kardashians. Or is it? In a recent study from UCSC (go Slugs) researchers tracked the size of insect wings with oxygen concentrations throughout earth history. What they found was that insect size correlated nicely with oxygen concentration until about 150mya. They found that insect size dropped during this time period, despite a worldwide increase in oxygen levels. Why were the bugs not as big as they could be? 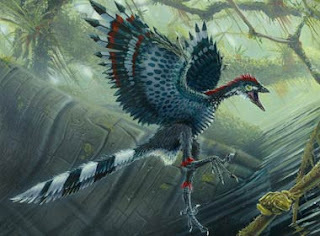 The authors argue it was the worldwide emergence of sophisticated aerial theropods (i.e. "birds") that put predatory pressure on flying insects to select maneuverability over size (all flying organisms lose agility with increasing size). Large flighted insects would both be easier to catch and also offer a greater caloric food reward than small ones for birds- they were optimal prey. The researches also found another dip in insect size later in the Cretaceous, possibly due to increasing sophistication of bird flight and the emergence of bats. They found no correlation between pterosaur emergence and insect size. perhaps bolstering the argument that pterosaurs were predominantly terrestrial foragers and not as well designed for aerial "hawking" as birds are. Interestingly modern flying insects are not as large as they could be- and we can thank birds for that. Harison, Jon. Atmospheric oxygen level and the evolution of insect size. Proceedings of the Royal Society Biological Sciences. March 10, 2010.